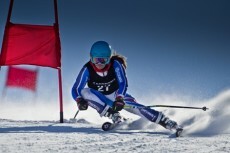 Florence Bell finished a very impressive 24th place in the Girls Slalom event in Innsbruck today. A very big well done to Florence in such difficult conditions. Official Results are downloadable here. I competed in my first race at the Youth Olympics today; it was the GS and I finished in 34th place (out of 55 racers). I was really pleased with my first run where I went from a bib number of 42 to 37th place. My second run, however, was not as good. Unfortunately, I think my lack of experience of the race piste, relative to the vast majority of the other girls, did not help me. Lots of people have asked me why I didn’t do the Super G or Super Combined events at the weekend; thinking that I had chosen not to race in them. 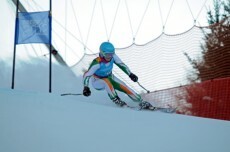 In actual fact the Snowsports Association of Ireland had set a points criteria in Super G of 120 and, since my points are higher, I was not entered. Having watched the races, I think I would have performed reasonably well in those races and I think that the experience of the race piste would have been beneficial for today’s race. I was very pleased to have several members of the Olympic Council of Ireland come to watch me race. The result of the race was: Gold: Clara DIrez (France). Silver: Estelle Alphand (France). Bronze: Jasmina Suter (Switzerland). So it was a very good day for the French! This evening, I went with Lynn and Jim to watch the medals ceremony and to see tonight’s band. I also got to see my Grandfather who arrived in Innsbruck today to watch me race. 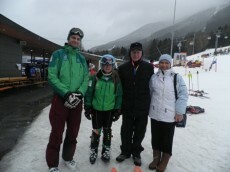 Lynn and I will be on the bus to Patscherkofel at 7.15am tomorrow for Slalom training in preparation for Friday’s race. Note from her team leader…… Finishing in 34th position was a good result especially for a non-snow nation, the countries finishing above IRE are all snow countries, Florence was also one of the youngest in the race most of the others who finished above her are a year older and therefore have a bit more experience. 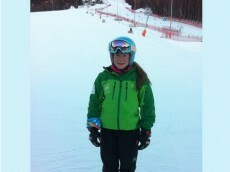 Florence Bell, starting in bib 42, finished in a credible 34th position in the Girls’ Giant Slalom at the World Youth Olympic Games in Innsbruck today. 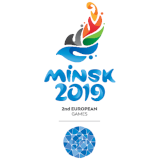 We hope to get more news from the mountainside in Patscherkofe and hopefully some reaction from Florence on her first lympic event. It was absolutely freezing when Lynn and I got up to the training hill at 7.30am today!! I had a reasonable morning of training but finished early so that I can prepare for the GS race tomorrow. I feel prepared (as prepared as you can be) and I am really looking forward to racing, now, On a different note, I was really pleased to exchange a PIN for a 1964 Innsbruck one at the Congress when we went for dinner this evening! 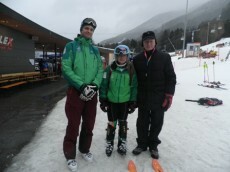 Great training (GS and Slalom) today on Patscherkofer with Lynn and it was VERY cold!! Lynn arrived late yesterday and it is really good to be training with her again – just like the old days at BSA. After a really good training session we went to the gym to recover. An early night is in order for more of the same (but starting earlier) tomorrow in readiness for the GS race on Wednesday. Had loads of facebook notifications and texts etc because I was on the local TV news this evening!! It was lovely to have a lie-in this morning, I have skiied every day for the last 6 days so I was relieved when my coach said that she wanted me to have a rest. 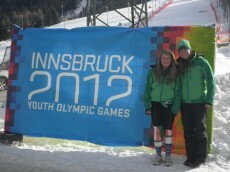 Anne went home to Dublin today so it’s a shame that she will not be here for the remainder of the Youth Olympics. However, I am really looking forward to training with my coach, Lynn Sharp, tomorrow and for the rest of my time here. I think an early night is for the best! Today was very cold up on Patscherkofel where the Alpine events are all taking place. I did some GS training and then prepared all of my skis for the next few days. The men’s Super G was won by a boy from Morocco! He actually lives in Canada but comes originally from Morocco and is their only competitor. I am pretty sure this is the first time that Morocco has even won a Winter Olympic medal so he must be very proud. 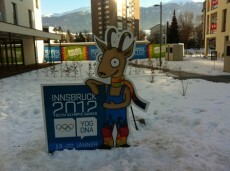 This evening we went to the Medal Ceremony Plaza which is in the centre of the old Town of Innsbruck. It was absolutely packed with people and was followed by a rock concert. I am really looking foward to having a day off tomorrow. I have skiied for 6 days in a row and I definitely need a lie in tomorrow! I woke up this morning in the Olympic Village to find that it was snowing but only a little. After finding the waxing room, I went up to the race hill with Jim where we did some gentle skiing, just to get familiar with the area. Today was the Opening Ceremony and it was really good. 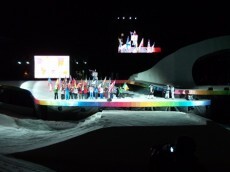 It was held in the same place that the two previous Innsbruck Olympics have been and, obviously, I carried the flag for Ireland which I felt very proud to do. I already knew some of the other flag-carriers and made friends with some of the others. When I looked at the thousands of people in the crowd I was completely amazed; I have never been in a situation like that in my life before. I felt really sorry for Christina Auger, the Austrian skier who said the Olympic Oath on behalf of all the athletes because she forgot her words. She must have felt terrible but the crowd all cheered her on. Seeing the Olympic cauldrons lit was very exciting. 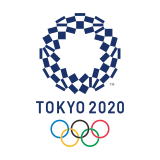 There were 3 of them; two from the 1964 and 1976 Games and a new one for the Youth Olympics. There was a huge roar from the crowd when Franz Klammer lit the second cauldron. The whole ceremony finished with a massive fireworks display and I had a facebook message from a friend to say that he had seen me carrying the flag on TV in the UK!